The first Dalek story of the 80s. 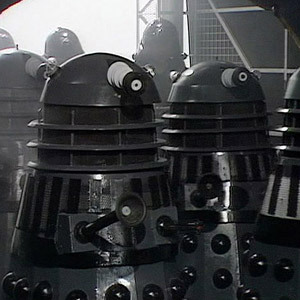 Resurrection of the Daleks was one of the darkest and most violent Doctor Who stories of the decade and provoked controversy from both fans and mainstream viewers. On 1980s earth a group of prisoners from the future attempt to escape onto the streets, but they are gunned down by two police men. In reality the prisoners were Dalek slaves, whilst the police men are human duplicates created by the Daleks. Two prisoners manage to escape to a nearby warehouse, though one of them is later killed by Dalek agents. Back in the future, the Daleks attack a prison ship and slaughter almost all of its crew. The Daleks are planning to rescue Davros who has been kept in cryogenic suspension for 90 years. The Daleks are served by a group of human mercenaries led by a man named Lytton. Lytton tells Davros that in the 90 years he was frozen, the Dalek and the Movellan war has finished, and that the Movellans defeated the Daleks. The Movellans were able to create a virus that attacked the Dalek mutants inside the casing, and virtually exterminated their race. The Daleks have now finally returned to their creator, hoping that he can find a way to cure them. Davros however is more reluctant at being used this time. The Doctor and his two companions, Teegan and Turlough meanwhile are dragged through a time corridor to modern day earth, near the warehouse where the two Dalek prisoners escaped too. There the Doctor meets the last surviving prisoner named Stein. As they explore the warehouse, Turlough vanishes, having been abducted by the Dalek time corridor. The Doctor also discovers the military have arrived at the house to investigate the sighting of some mysterious bomb like objects. Just then the Daleks having seen that their plan to drag the Doctor to earth using their time corridor has succeeded, send a Dalek to capture him. The Doctor however is able to destroy the Dalek with the aid of the military, though not before it exterminates a soldier and wounds Teegan. The Daleks however don’t give up and send more Daleks who not only exterminate the entire military squad, but duplicate them as well. The duplicate military squad capture Teegan and the last surviving scientist Laird, whilst the Doctor and Stein make their way to the Dalek ship through the Dalek time corridor. There the Doctor discovers that Stein is a Dalek duplicate and double agent. The Doctor is captured and the Daleks reveal why they brought him and his companions to earth, so that they could be duplicated. The Doctor and his companions duplicates will then be sent to Gallifrey to assassinate the high council of the Time Lords, paving the way for a Dalek invasion of Gallifrey. Turlough meanwhile meets up with the few survivors of the prison ship who try and activate the ships self destruct device to eliminate Davros, but Lytton finds them and slaughters the survivors, with only one, Mercer, escaping with Turlough. Laird attempts to stall the Dalek duplicates long enough for Teegan to escape, but unfortunately she is captured outside by the Daleks duplicate police officers. Laird is then killed by the Dalek soldiers when she attempts to flee and Teegan is sent to the Dalek ship, but fortunately Teegan is found by Turlough and Mercer first. The Doctor meanwhile though almost killed in the slow, torturous process of creating his duplicate is able to escape thanks to Stein, who is able to break free of the Daleks mind control. The Doctor, Stein, Teegan, Mercer and Turlough reunite and escape to the TARDIS which the Daleks had brought on board. There the Doctor decides that he must kill Davros as Davros is the only chance the Daleks have of surviving the Movellan virus. Mercer and Stein who both want revenge agree to help the Doctor, whilst Teegan and Turlough are sent back to earth in the TARDIS. Davros meanwhile using a mind control device, has taken control of several of the Daleks human servants and two Dalek drones. He plans to use the Movellan virus to exterminate the Daleks who he has realised will never follow him, and then create a new race of Daleks loyal to him. When the Doctor arrives in his cell he attempts to shoot Davros. Davros attempts to weasel out of it at first, but when he realises that the Doctor doesn’t have it in him to commit cold blooded murder, he starts to taunt him. The Doctor, Mercer and Stein are distracted by a group of Lytton’s men who arrive. In the fight Mercer is killed, and Davros seals them all out. Stein meanwhile flees, fearing that the Dalek control is taking him over again. A squad of Daleks arrive and begin to fight with Davros’ Daleks and human servants, but the Doctor who arrives back through the corridor kills all of the Daleks using a sample of the Movellan virus. During the fighting Lytton attempts to shoot the Doctor a few times, before escaping into the streets in disguise as a policeman. As both groups of Daleks and all of Lytton’s men are killed, back on the station Davros attempts to leave, but he is cornered by two Daleks who knowing that he is planning to betray him, try to shoot him. However the Movellan virus that Davros unleashed on the base kills them. Davros declares that the Daleks are dead, long live the new Daleks, but as he attempts to leave the Movellan virus begins to affect him. With his DNA it seems being similar enough to a Dalek for the virus to work, Davros screams out in denial that he cannot die as the virus seemingly engulfs him. Stein meanwhile having managed to fight off the conditioning again is able to activate the stations self destruct sequence just as the Daleks shoot him, and the prison ship is destroyed, seemingly taking Davros with it. With the Daleks invasion plans foiled, the Doctor prepares to leave, but sadly his companion Teegan refuses to come with him. Having seen too many good people die, Teegan says she can’t go on anymore and tearfully runs out of the warehouse. As she watches the TARDIS leave for the last time, her final words are that she will miss the Doctor. Resurrection of the Daleks is a minor classic in my opinion. Its not quite on the level of Genesis or Day, but its a brilliant story nonetheless. Its true that Eric Saward perhaps crams it full of too many ideas. The Daleks plan to invade the earth and Gallifrey at the same time, free Davros, make him cure the Movellan plague, whilst Davros similarly plans to turn on the Daleks and wipe them out, and create his own race of Daleks! Still for the most part Saward is able to weave all of these different strands together and have them all interact with one another into one coherent narrative, rather than just lie, completely unconnected. Above all else Resurrection makes the Daleks seem like a proper threat again after their bumbling performance in Destiny. Here the monsters get to exterminate dozens and dozens of people and once again just one Dalek is shown to be a legitimate threat, with a mere two of them slaughtering an entire heavily armed bomb disposal squad. A lone Dalek should always be portrayed as being capable of taking out at least several humans, as after all a Dalek is meant to essentially be a mini tank. What’s more effective about the high body count in this story is that the Daleks kill people who are of no threat or importance to them. In almost every other story, whilst the Daleks have shot plenty of unarmed people, its always been someone like a rebel, or a traitor to their cause like say the Controller. In this story however we see helpless old men just get gunned down in the streets who have no idea who the Daleks even are. One particularly gruesome scene sees the Dalek controlled policemen shoot an old man in the distance after cornering Teegan. Whilst some have accused these sequences of being gratuitous violence, I think they demonstrate how the Daleks view all life as their enemy brilliantly. As the 5th Doctor himself says, it doesn’t matter how you react, the Daleks will always see other life forms very existence as a threat. I like the way this story also gives the Daleks a chance to be more manipulative too. The idea of the Daleks using duplicates of their enemies to slowly manipulate and crush them from within is a terrifying concept. For the first time there is really a sense of paranoia around the monsters. Now anyone you know could be one of their duplicates. I love the way that the black Dalek states that the Daleks no longer even need to invade anymore thanks to their duplicates. Its sad that other than a passing mention in Into the Dalek, the idea of the Daleks duplicates was never picked up on in later stories. I honestly think there is a wealth of more interesting stories to be played with using the idea. As for Davros, I think he fares better here than in Destiny. Terry Molloy is a better fit for the character than David Gooderson. Granted the script doesn’t give him as much to do as Revelation and later Big Finish audio’s would but he still puts in a great performance and plays well off of Peter Davison. Just like Michael Wisher there are some wonderful big hysterical rants where Molloy gets to chew the scenery, but also some nice subtle moments in his performance such as when he tells the Daleks quietly that he is very difficult to kill. Its a brilliant call back to Genesis. This story moves the Davros/Dalek relationship on quite well as we see how Davros begins to resent the Daleks. That’s twice they have betrayed him and so really he’d be a mug to not have a back up plan this time. Its a brilliant irony the way this time the Daleks are the ones who underestimate Davros. They assume after Destiny that he will always be willing to return to his “children” and it never even occurs to them until its too late that Davros actually wants rid of them this time. The scene where Davros murders the two Daleks with the virus and they scream and beg for mercy whilst he ruthlessly screams “YOUR LIVES ARE OVER” is a nice little reversal of the ending of Genesis of the Daleks, where Davros having underestimated the Daleks was begging them for mercy before they gunned him down. This story also marks the real beginning of the power struggle between Davros and the Dalek Supreme which will become a major plot point in subsequent Dalek stories. Davros’ relationship with the Doctor is also well developed in this story. I never really thought it before, but on a recent rewatch I think that Peter Davison’s Doctor plays brilliantly off of the Daleks and Davros. The fact that he is so vulnerable and sensitive allows the Daleks and Davros unrelenting cruelty to seem more effective than it did with say Tom in Destiny who tended to laugh in the face of danger. 5 and Davros’ confrontation is one of my favourite moments. I love the way that Davros actually considers the Doctor not being able to shoot an unarmed man in cold blood to be a sign of weakness. I feel you can also see quite a nice build up to the Sixth Doctor in this story too. Here the 5th Doctor’s mercy causes Davros to escape and he instantly regrets it. He knows that Davros will cause more death, so for his next regeneration he decides to adopt a more ruthless persona. Teegan’s departure is one of the most moving as well as one of the most bleak in the shows history. She isn’t killed off like Adric, but she is still left emotionally broken by the horrors that she has witnessed. Its also possibly the only time that the Doctor and a companion end things on bad terms. The Doctor is never happy to see his companions go, but at the very least he can be happy for them. Even with Rose, he knows she is going on to a happy life in the other universe. With Teegan however in their final scene together, the Doctor chases after her telling her that their relationship can’t end on this note, only for her to ignore him. Its a very bold way to end any companions tenure, never mind one of the longest serving in the shows history. Aside from its importance in the shows history, Resurrection of the Daleks stands up as a great piece of tv in its own right too. Its brilliantly directed, the production values are of a very high quality, the sets are well designed, and whilst Sawards many different story strands at times might make the show seem a bit overly complicated, at the same time they also make sure there is never something not going on. To be honest I’ve always thought that Resurrection of the Daleks was a great story to introduce someone to Doctor Who with. Its fast paced, its special effects are not embarrassing at all, the acting from all the leads is brilliant, the Daleks are vicious and scary, the music is subtle and effective, and its a very dark story. It instantly betrays a lot of the negative myths that developed about Doctor Who being a silly, slow, series with dreadful effects. Overall whilst not one of the top 5 Dalek stories, I’d still say that Resurrection is a classic and criminally underrated. Attack of the Cybermen, made the following year is a sequel of sorts to this story. It follows Lytton who was left stranded on earth at the end of this adventure. Lytton is portrayed more sympathetically in Attack than in Resurrection. He claims that he only worked for the Daleks because he had no choice. It should be mentioned that whilst Lytton had no problem with killing people on the Daleks orders, the black Dalek did still consider him untrustworthy and eventually ordered him killed. Lytton later attempts to help the Cryons save humanity from the Cybermen in Attack. Though he is being paid to help the Cyrons, Lytton nevertheless does still genuinely help humanity and the Doctor at the expense of his own life. When the Cybermen capture him, they promise to let him go if he betrays the Cryons whereabouts (which would also doom humanity), but Lytton refuses and not only withstands torture, but also cyber conversion too. His final act is a futile attempt to fight off the Cyber controller to save the Doctors life. All of this causes the Doctor to believe that he may have misjudged Lytton at the end of Attack of the Cybermen. One of the Dalek voice actors for this story, Brian Miller is the husband of Elisabeth Sladen who played Sarah Jane Smith. This story marks the first time that the Daleks are shown to take the fight to the Time Lords. It is regarded as one of the first strikes of the Time War in this respect. A Movellan makes a tiny cameo at the start of the episode as one of the prisoners fleeing down the street who is killed by the Dalek’s duplicates. He is not identified on screen as a Movellan however, but this apparently was the original intention, and there is nothing to suggest that he is not a Movellan. This story marks the first appearance of a black Dalek on tv since The Daleks Masterplan. John Nathan Turner, Doctor Who’s longest running producer contributed a short interview to the DVD release of this story. Sadly it ended up being his only contribution to the DVD range as he passed away just a few months later. This story marks the 8th time the Daleks try and invade the earth. In The Dalek Invasion of Earth and Day of the Daleks they invade and conquer the earth, whilst in Frontier in Space/Planet of the Daleks, Death to the Daleks, The Evil of the Daleks, and the Daleks Master Plan, they plan to destroy humanity through other means, such as a space plague, provoking a war etc. When the Daleks are draining the Doctors mind, archive footage of all of the Doctors companions and previous incarnations appear except for Leela. Ian Levine, the shows continuity adviser admitted this was an oversight on his part.